In the latest DGWGO blog from Nick Morris, owner of the Station House Cookery School in Kirkcudbright, we find out all about how Nick likes to keep it local by supporting local producers. 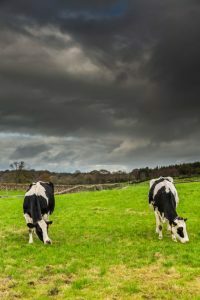 Nick tells us all about his Milk and cream supplier, Roans Dairy and shares a wonderful recipe with us for making your own butter, Yougurt, Labneh and Crème Patissiere. 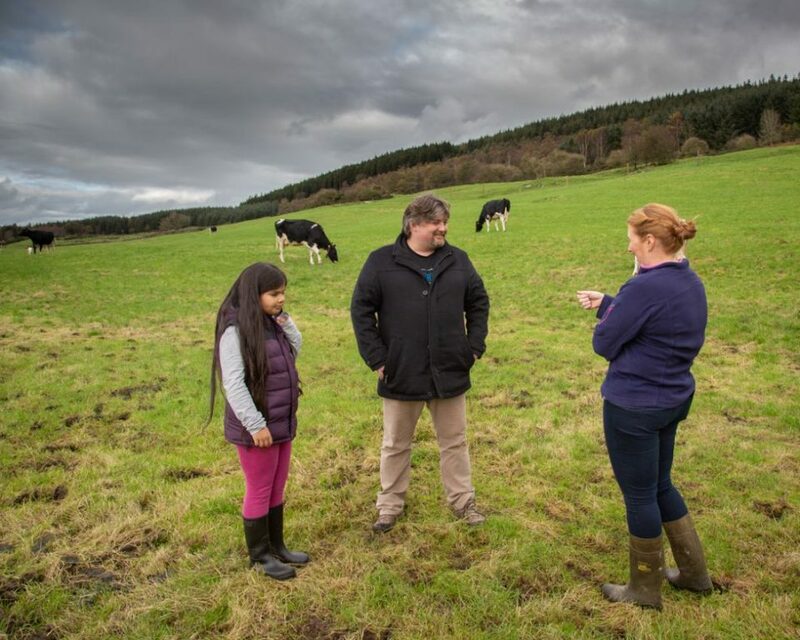 Nick and his Asha daughter talks to Aylett Roan, and meet the Cows that produce their milk. Nick said “When I first moved to Kirkcudbright to open the cookery school, I immediately started to visit local producers who caught my eye as doing things the ‘right’ way. I had read about the Roan family and how they had begun to distribute directly to their clients rather than sell to the supermarkets. This would give them more control over the quality of their product and the price they were able to command for their milk. Supermarkets drive the price they are prepared to pay the farmer down which means that many farmers have to diversify their business in some way as it’s difficult to make a living with the price offered. Roans decided to go to their clients direct. This is just the way I like it as I am able to learn about the production process and also about why we should be supporting dairy farmers like Roans. 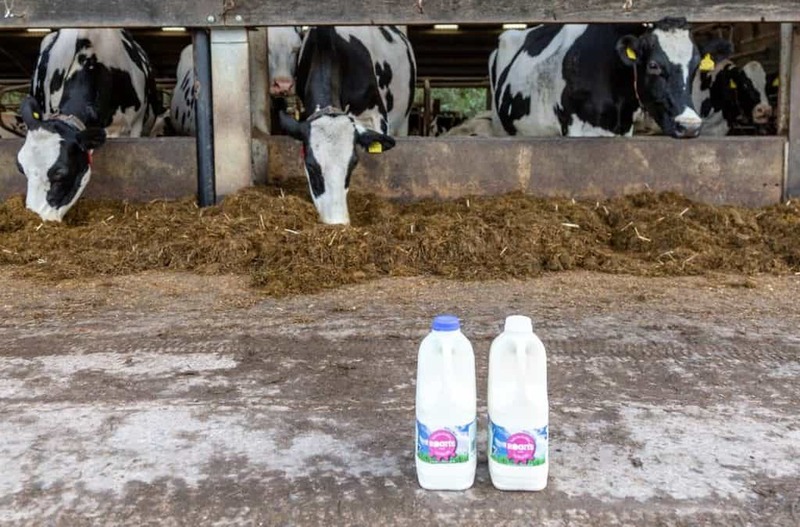 So, why should we be buying Roan’s Dairy milk? Firstly, the temperature at which milk is pasteurised differs from one producer to the next. As a rule of thumb, the higher the temperature the longer the shelf life, but at a higher temperature the milk has the good vitamins knocked out of it. A higher temperature also denatures the proteins to a greater extent which can affect the taste of the milk. Roan’s milk simply tastes better and has more nutrients because it is treated at a lower temperature. But beyond just the quality of the milk is the connection with your producer which I feel strongly we should maintain as consumers. When we have questions about the milk, we are able to call up a member of the Roan family and ask. Imagine that with your larger suppliers! They are a knowledgeable and approachable source which keeps us connected with our food supply. Something I believe we desperately need to maintain. We often forget that the simplest of things can be the most beautiful, homemade butter is one of those things. However, as it comes from one ingredient, double cream, you need to make sure that it is of the highest possible quality. Making butter is simply agitating the cream so that the fat molecules separate from the buttermilk. This can be done by putting the cream in a jar and shaking until separation is achieved. The buttermilk is acidic and will make the butter go rancid much quicker if you don’t wash it out thoroughly. Adding salt aids the preservation process as well as enhancing flavour. So here we go, take your full fat double cream and place in a mixer with a balloon whisk attachment or in a bowl for use with an electric hand whisk. Whisk the cream and keep on whisking, you’ll notice it start to go grainy and then moisture begin to appear, that’s the buttermilk. Keep on whisking until you have what is clearly identifiable as butter sitting in the buttermilk. Drain the buttermilk off and keep that for other uses such as drinking, soda bread or marinating chicken. Now submerge the butter in very cold water and squeeze out as much of the cloudy buttermilk as possible. Add salt to the butter for preservation and flavour, it can be left out if you so wish however. Form into your chosen shape, I use butter pats but you can use whatever you have to hand. Wrap in greaseproof paper and use as required. It freezes well. Flavour it up with herbs or spices. Having small individual butters in the freezer are great to have on hand to throw into grilling meats or veg for extra flavour. It’s a foodstuff that is believed to have been around since 5000 – 6000 BC and is thought to have been first stumbled on by Mesopotamian herdsmen storing their milk at just the right temperature for bacteria to thicken up the milk. This process is very similar to what we do to this day. Heat loving good bacteria munch on the sugars in milk which produces lactic acid which in turn causes it to congeal. Simple. Getting the temperature to 80 degrees helps in two ways. Firstly, it kills of any unwanted nasties should they have got into your milk somehow. Secondly, the most abundant protein, lactoglobulin, is unravelled at this stage which helps it to bind to other proteins resulting in a thicker curd. Once you have made your own yoghurt you will never return to the supermarket variety again. It has a lovely texture and with a few tweaks you can control how tangy or thick your yoghurt is. Whisk the milk powder into the milk. Heat the milk to just over 80 degrees C. Use a kitchen thermometer if you have one. If not, this is the point when the milk is steaming, a light skin forms and it looks like it’s just about to bubble. Leave to cool to 45 degrees C. This is the point where you should be able to leave your finger in the milk for an extended period of time without discomfort. Now stir in the yoghurt. Don’t whisk it but stir in well. Pour into a pre-sterilised jar and wrap up nice and warm to ferment. You are looking for a warm temperature so an airing cupboard or by a radiator is ideal. If it’s not warm enough, it won’t work. Trust me. I leave it overnight but generally, the longer the ferment the tangier the taste. Once thickened I transfer to the fridge. Gorgeous with a drizzle of good local honey. Labneh is a beautifully soft and creamy cheese which is one of the Middle East’s best kept secrets here in the UK. It’s not certain exactly when Labneh was first created but cheeses made from strained yoghurt have been eaten in the Levant for thousands of years. Ancient Bedouin tribes had a dried version which suited their nomadic lifestyle. Delicious when mixed with your favourite herbs, most commonly za’ atar which is a predominantly thyme based herb mix. But you are only limited by your imagination as to what to do with it. A Station House favourite is to slather a thick layer on to sour dough toast and top with grilled vegetables like aubergine, courgette or pepper. It’s healthy too as it’s a probiotic food loaded with good bacteria for your immune system. To make labneh at home you’ll need a cheesecloth and a bowl, that’s it. Simply take your homemade Roan’s yoghurt, mix in a little salt and pour into the cheesecloth which is lining the bowl. Hang above the bowl as the whey will separate from the yoghurt and drip through the cheesecloth. 24 hours in a coolish place should do it. And now for something a little sweet. Crème patissiere or Crème Pat as it’s known in the trade. This is a great one to have in your culinary repertoire as it’s simply delicious and impresses your guests no end. It looks impressive but is deceptively simple. Crème Pat literally means the Patissier’s Cream in French. It’s used in a wide variety of ways from filling fresh fruit tarts to lining flaky pastries. I’m unashamedly using Michel Roux’s recipe here because he knows a thing or two about French desserts in my opinion! The taste of your Crème Pat will be determined by the taste of your ingredients. Use good quality full fat milk, don’t even think of substituting cheap supermarket milk, it will not be the same. Roan’s is an excellent choice. Use good quality free range eggs, I use Upper Senwick Farm eggs which I highly recommend. Try to get a vanilla pod if you can, if not use a good quality vanilla bean paste or extract. Don’t use essence! Crème Pat has flour in it. That means you need to cook it out, unlike a flourless crème anglaise which is thickened gently over a low heat, Crème Pat needs a more rigourous temperature to get the flour cooked out. If you don’t you’ll be left with a nasty floury aftertaste. Not good. 6 free range egg yolks. Put the milk, vanilla pod and half the sugar into the saucepan and heat. Before it boils turn the heat off and leave to infuse for as long as you can. An hour or so is good enough. Separate your eggs. Freeze the whites for future use, meringues for example. Mix the remaining sugar with the yolks in a large bowl and whisk until creamy and combined. Pour the cooled milk through a sieve onto the egg yolks and sugar and whisk. Keep the pods and put into a jar of caster sugar, in a week or so you’ll have lovely vanilla infused sugar. Return the milk, eggs and sugar mix to the saucepan and heat. Stir it constantly as it will catch on the bottom. Keep on the heat until all of the floury taste has been cooked out. Transfer to a bowl to cool, place cling film over the top of the Crème Pat so a skin doesn’t form. Fill up a pre baked tartlet case with crème pat and top with your favourite soft fruit. I hope you try some of these ideas, please get in contact with us at the cookery school for more information about upcoming classes. Kirkcudbright Station House Cookery School Up and Running!